Comments: A formulaic show with average animation and predictable outcomes...that is a heck of a lot of fun to watch. This is my first foray into the realm of Mahou Shoujo (Magic Girl) anime, and I have to admit, it's been pretty enjoyable so far. Magical Project S is a spin-off from the galaxy-wide Tenchi Muyo universe, but while there are plenty of characters from Tenchi, most of them are relegated to cameos. Tenchi himself only appears after the first ten or so episodes, and then he fades away again. If you're a follower of the graphic novels (published by Viz), then you may recall that the title of the third volume was Magical Girl Pretty Sammy. This series is the expansion of that little segment into a show depicting an alternate take on the Tenchi universe. On the magical world of Juraihelm, the gentle Tsunami has been granted the status of Queen to be, with the title of Queen coming only after peace on Earth has been reestablished. Essentially, Tsunami chooses Sasami Kawai to take on the responsibility of restoring balance to the Earth by fighting the forces of evil and spreading love and happiness to all. 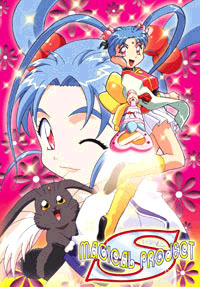 To do so, Sasami must transform into the Magical Girl Pretty Sammy and use magical powers. The series frequently reminds us that tranquility must be reclaimed on the planet - though I really have trouble thinking of a single period in human history when everything was harmonious and in balance. Anyway, though Tsunami doesn't know it, her good friend (and secretly, her greatest nemesis), Rumiya is plotting to take the throne herself by defeating Sammy and allowing chaos and hatred to overthrow the Earth. Rumiya chooses Sasami's close friend, Misao Amano, as her avatar of evil on the blue planet, and uses dark magic to force Misao into becoming the Magical Girl Pixy Misa in order to thwart Sasami's efforts. For the most part, each episode begins with Rumiya being annoyed that she's still not the Queen of Juraihelm, so she forces Misao to change into Pixy Misa. Misa then creates a "Love love monster" that attacks some innocent people, prompting Sasami to change into Pretty Sammy and destroy the monster, causing Misa to retreat. And so it goes. There is some variance, especially in the later episodes (on volume two), but mostly things occur in that order. And somehow, this predictable repetitive pattern is enjoyable. The trick is, Magical Project S never takes itself too seriously. This is primarily a comedy, and while it's certainly a Magical Girl anime series, it doesn't refrain from poking fun at the genre whenever a chance arises. The characters frequently break the fourth wall, and yet it's not too much to ruin a viewer's immersion in Sammy's world. Somehow, even though Sasami doesn't undergo much of a physical change when she becomes Pretty Sammy, everyone believes they are two different people. Even Sasami's loving parents are clueless when it comes to Sammy's true identity, and there are a few instances where the creators of the show flash signs across the bottom of the screen saying things like "Haven't you caught on yet?" or "Get a clue!" There's usually a stock animation transformation scene when Sammy changes, and in an episode where Sasami was changed into a baby (by one of Washu's potions, for those of you who may be Tenchi-savvy), she had to become Pretty Sammy while still in infant form. So, for the transformation scene, rather than animate a new one, the regular sequence was still used even though it confused Sasami. Her companion, Ryo-ohki simply said, "I'm sure there must be some explanation for it," when she asked why she was a baby, then her usual self for the change, then a baby again. It was really funny, and there are plenty of similar moments in the show to keep you smiling. The background music doesn't stand out too much, but the four theme songs are cute and playful, and occasionally there's an in-episode song as a treat. Sound effects aren't too pivotal in this series, but everything that's here sounds fine. Both music and sound effects easily adhere to the theme of cuteness that permeates the entire series. The voice acting is pretty good, so long as you like hearing a cast composed primarily of young girls speaking in Japanese. Luckily, I do. Magical Project S was released in an admirably swift manner, and there are only two volumes to pick up to get the entire TV season. Each volume contains two discs, so there should be plenty of Mahou Shoujo love for fans of the series. Another interesting choice is the lack of an English language track. That's right, you heard me - there is no English dub. For people like me (who only listen to dubs if we have to review them), this doesn't affect my enjoyment at all. In fact, I appreciate the risk Pioneer is taking in releasing a Japanese-only DVD collection. Since I'm not just reviewing this for me, however, I have to take off ten percentage points from the score because of the lack of an English language option. In the publisher's defense, though, I'd have to say that this is a very Japanese show. It would be a serious challenge for an English-speaking voice actor or actress to accurately portray the insanely energetic characters in this series. Also, the lack of a dub is easily one of the factors keeping the price of the two volumes relatively low, a benefit I'm always happy to take advantage of. Somewhat making up for the lack of a dub is the crazy amount of extras Pioneer has crammed onto each volume. There is a nifty little illustration card in each box and plenty of on-disc bonus material as well, including a number of short "Omake" (bonus) segments related to the show, art galleries, and clean opening/ending sequences. The Omake sequences are extremely funny, somehow taking the lighthearted show to another level of delightful bizarreness. The cover design is almost as cute as the show, and the box is a nice double-wide clear plastic keepcase to happily house the two DVDs that come with each volume. I really enjoyed these four DVDs (spread across two volumes), and frankly, the exclusion of a dub doesn't bother me at all. However, if you can't stand the thought of watching a show in a language other than English, this might not be the series for you. Otherwise, this is a fun series with humor that works on many levels, so you don't have to be a kid to enjoy it. This odd subset of the Tenchi Universe is a welcome addition to the series, and any fan of Mahou Shoujo anime should get a kick out of Magical Project S.